Celebrate Tourism Week | Backcountry Lodges of B.C. Celebrate Tourism Week | Backcountry Lodges of B.C. The Backcountry Lodges of British Columbia Association is joining communities, cities and regions around British Columbia to recognize National Tourism Week—May 28 to June 3, 2017. The tourism industry is a powerful force in British Columbia (BC): approximately 19.7 million overnight visitors vacation in BC each year, contributing $15.7 billion in revenue annually to the provincial economy. Tourism touches every part of our province and has become one of BC’s leading business sectors. The BC visitor economy comprises nearly 19,000 tourism-related businesses that employ more than 127,500 people. In 2015, tourism contributed more to GDP than any other primary resource industry including oil and gas extraction ($7.2 billion), mining ($3.8 billion), forestry and logging ($1.9 billion), and agriculture and fish ($1.5 billion). BC’s tourism industry experienced record setting numbers last year, and the trend is continuing as businesses and destinations across BC have already enjoyed a busy first quarter and are anticipating more record results this summer. 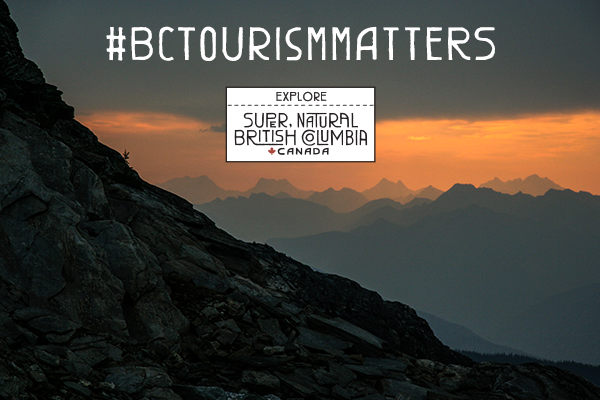 Operators and communities around BC are sharing their Tourism Week celebrations on social media using the hashtag #BCTourismMatters. In 2015, there were approximately 19.7 million overnight visitors in British Columbia who spent $9.9 billion. Over half of the visitors (58.6%) were British Columbia residents. Visitors from other parts of Canada accounted for 17.9% of all visits and international visitors accounted for the remaining 23.5% of visitor volume. While British Columbia residents made up the largest share of visitor volume, international visitors made up 41.5% of visitor expenditures. British Columbia residents accounted for 33.7% of visitor expenditures and other Canadian residents accounted for the remaining 24.8%. In 2015, British Columbia’s tourism industry employment was estimated to be 127,700, a +1.2% increase from 2014. This means that tourism provides a job for roughly 1 out of every 16 people employed in the province. The tourism industry generated $4.1 billion in export revenue in 2015, growing +6.6% from 2014. GDP for the provincial economy as a whole grew 3.1% over 2014. The tourism industry contributed $7.4 billion of value added or GDP (in 2007 constant dollars) to the BC economy. This represents 5.6% growth over 2014 and 17.5% growth since 2007. British Columbia’s tourism industry generated revenue of $15.7 billion in 2015, an increase of +5.3% from 2014. In 2015, tourism contributed more to GDP ($7.4 billion) than any other primary resource industry including oil & gas extraction ($7.2 billion), mining ($3.8 billion), forestry & logging ($1.9 billion), and agriculture & fish ($1.5 billion). Tourism is a key economic driver in BC. In 2015, tourism contributed more to GDP than any other primary resource in British Columbia. Tourism is a growing industry, over the last few years there has been an increase in visitors, in the number of businesses and number of people employed in tourism. 2016 was record-breaking year for tourism in BC; we welcomed over 5.5 million international visitors–up 12.3% over 2015. Looking ahead, 2017 is poised to be a record-year for the BC tourism industry as well. Tourism is one of the fastest growing industries globally and brings incredible benefits not only for visitors, but also social, cultural and economic benefits for BC residents. Tourism is a key economic driver and one of BC’s competitive strengths in the world economy. Tourism strengthens international perceptions of British Columbia, which has positive impacts on trade and investment, international education, and immigration. and many other benefits that make life so good here in BC. Tourism opportunities exist in every corner of our province. It’s good for cities and it’s also good for rural communities. BC has nearly 19,000 tourism businesses across the province, both rural and urban, of every size and make-up. These businesses, many of them small, support BC’s economy and provide a wide range of interesting jobs. Tourism supports well-paying jobs in management, technical and professional services—jobs like international sales people, highly-trained outdoor guides, helicopter pilots, wellness experts, sommeliers, hotel managers, fishing guides, bus drivers, ski instructors, event organizers, and so many more. TIABC: Facebook, Twitter, Instagram and LinkedIn.